Librarians as a professional group are experiencing considerable changes as their work is expected to be more and more effective, and the education and information markets are becoming increasingly competitive. It is therefore vital to define and diagnose the main areas of library activity. The following text discusses the key aspects related to the functioning of libraries in Poland in 2015 (library networks, resources, services, facilities, users), and attempts to analyse the trends that are crucial for those institutions (on a macro- and micro-scale). This analysis aims at answering the question about the most important changes which impact on the functioning of, and demand for, library services, as well as discuss major achievements, weaknesses and potential niches in library activity, and how to respond to the changes which are currently ongoing. Changes in public communications and the transformation of libraries are the two dominant trends when we analyse libraries today. The most frequent problems connected with the work of individual libraries, their standards and also their development, include: the atomisation/dispersal of libraries, and changes to the work organisation in libraries towards developing various forms of cooperation (networks, consortia). The main ideas of present-day librarianship involve acting as a “middleman” in public communications, integration with the environment and the library’s ‘offer’ in the broadest meaning of the word. differently depending on the type of library. An an alysis of the condition and potential of libraries indicates that, on the one hand, the networks of different types of libraries have tended to shrink (drop in number) while, on the other hand, all these types are undergoing a modernization process with the introduction of new technologies and services. The article discusses the wrong attribution of three engravings to Cyprian Kamil Norwid. The author has determined the actual authorship and origin of Original Sin, an etching previously believed to be a unique copy of an early engraving by Norwid. The engraving Il peccato originale was made by the Italian artist Nicola Consòni and published in 1841 in an album entitled Raccolta delle opere di Raffaello. The author also discusses doubts as to the attribution of the etching St. Mary Magdalene glued into the so-called Berlin Album as well as of Eagle on a Rock, a lithograph. Additionally, the paper reflects on how Norwid used themes from works by old masters as well as from contemporary graphic patterns. This article is a synthesis of information obtained from two surviving large parts of the book collection of the former library at the Kripplein Christi Lutheran Church in Wschowa (Fraustadt), which have been in the holdings of the National Library of Poland since 1949. This library existed formally from 1641 to 1945. In 1881, the Staatsarchiv Posen (later the National Archive Library in Poznań) took 724 volumes on deposit. After World War II, the two separated parts of the collection both came to be deposited at the National Library in Warsaw. The data contained in this article puts in order all the accumulated knowledge about this library. 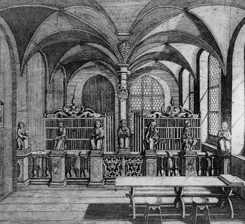 There is a discussion of the attempts made to organise and inventorise the collection, and an analysis of the 1656 manuscript catalogue of the Wschowa library (also preserved at the National Library), which is the basis for the reconstruction of the founder’s library. The information provided will make it easier to navigate the dispersed collection and enable the identification of books from the particular legacies. Research into emblems and emblem books is currently gaining ground among a growing number of scholars of diverse disciplines. The present work should be reckoned among more traditional approaches to emblem studies attempting to trace the origins of the texts under scrutiny. As such, the research has been centred around the reception of specific images adopted from the ancient Greek and Roman coins. This extends to both iconography and numismatic legends resonating in mottoes, emblematic compositions (adopted as titles), and epigrams. In terms of its content, the research is centred on the relationship between Emblematum liber by Andrea Alciato and ancient numismatic artefacts. It is assumed that the first collection of emblems serves as an apposite example of this relation in the 16th century. This is confirmed by a proliferation of studies on this work, which testifies to its popularity in academic circles and among general readership. Revered and imitated in the 16th and 17th centuries, Emblematum liber by Alciato was an epitome of emblem books. Since the collective conclusions from the scholarly research on Alciato’s work can be extended to the study of numismatics in a broader context, they are in a certain way universal. The text is divided into three consecutive parts. The introductory part discusses such aspects as the origin of emblematic works, their relationship with the ancient coinage, the reception of ancient coins in modern times, the development of specialised sources on numismatics and its impact on the explanatory notes in Emblematum liber, as well as the reference to the coins in Alciato’s works. The second part, the most extensive one, comprises a number of chapters orientated towards analysing selected works adopted from Alciato’s book of emblems, intended to demonstrate manifold relationships between the works in question and ancient numismatic artefacts. In some cases the imputed links are fairly obvious, posing little challenge in terms of identification and description. In other cases it is the opposite. In fact, on a few occasions it failed to provide a definite answer as to the provenance or sources inspiring certain works. At such rare moments, the author posited a number of tentative hypotheses. Finally, the closing part offers consolidated onclusions based on the analytical section. Additionally, the final part puts forward some general conclusions, such as an attempt at demonstrating the ways in which Alciato, his commentators and publishers exploited ancient coins for artistic purposes or otherwise. Neither Alciato nor his followers really assigned new meanings to the numismatic symbols of given artefacts. The value of those symbols resulted from their high popularity and embeddedness in the European culture, and as such, they hardly posed a challenge to interpretation. Modifications, rather rare and minor, resulted in some motifs assuming a more universal expression. Although such alternations of numismatic symbols are by no means radical, they do call for careful attention. The study of emblems rendered the themes it appropriated more universal, and considered them away from any specific historical events. Such was the case of numismatic iconography. It still remains uncertain whether the numismatic motifs placed on emblems resulted from the author’s first-hand encounter with the coin, or were based on some scholarly work with an annotated interpretation of the symbol. Numismatic compendia were also a crucial source of information for scholars at the turn of the 16th and 17th centuries. In fact, scholarly studies containing illustrations of the coin reverses could spare one the hassle of visiting a private collection in person. Through the wide circulation of printed books, people could gain an insight into the collections of, say, Guillaume du Choul or Johannes Sambucus. This allowed the reader access to many rare items, as well as their expert interpretations. One such source was Hieroglyphica by Pierio Valeriano, which offered descriptions of many coins, along with their inscriptions. The influence of numismatic studies is not at all limited to the 16th century works and further. It is worth noting that the traces of these influences are present in Alciato’s oeuvre. The 19th -century press still holds many mysteries for researchers, such as undiscovered serialized novels. This paper provides an account of how a previously unknown novel by Stefania Sienkiewicz, mother of the famous Polish writer and Nobel Prize-winner Henryk Sienkiewicz, was discovered 151 years after publication. The find was made possible thanks to digital tools and their new functionalities.